The first time somebody made off with “a cash register, CD player, speakers and lights,” while Evans interrupted a second potential thief in the process, who was charged with misdemeanor criminal trespassing. According to Evans’s wife Chenavis the police seem reluctant to investigate the case, and recommended that the Evans not press charges to avoid ruining peoples’ lives. The Evans think the Craigslist post was related to the fierce Auburn-Alabama rivalry, which reached its peak in last weekend’s annual Iron Bowl. 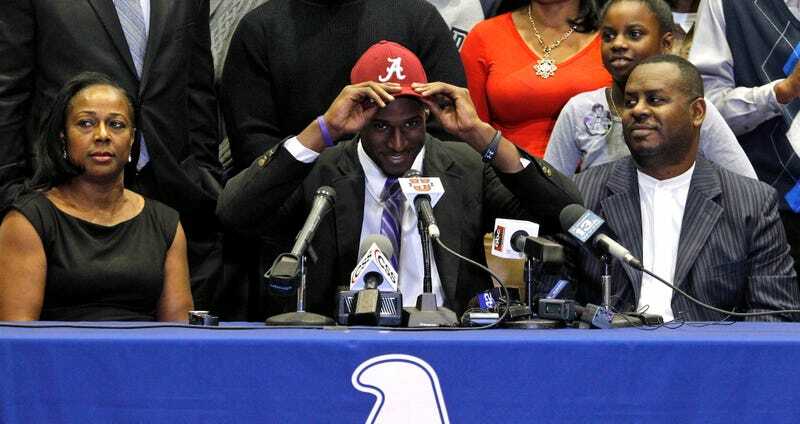 Alan Evans played for Auburn, but while Rashaan Evans went to Auburn High School, he chose the Crimson Tide over his hometown college and father’s alma mater.